1. So. Many. Vitamins. And as wonderful as supplements are, it's so much better when they come directly from the source! 2. Fiber! I get so cranky when my digestive system isn't in check, and when I eat a high bulk diet rich in vegetables, I never have that problem. 3. They are super low calorie. You can satisfy your appetite with vegetables for a meal, throw in some healthy fat and protein, and you're good to go while keeping your calorie count in check. 4. They are delicious. I love them all. And they are so versatile! 5. They are cheap! Contrary to popular belief, produce is really accessible. Shop the perimeter, not the aisles! 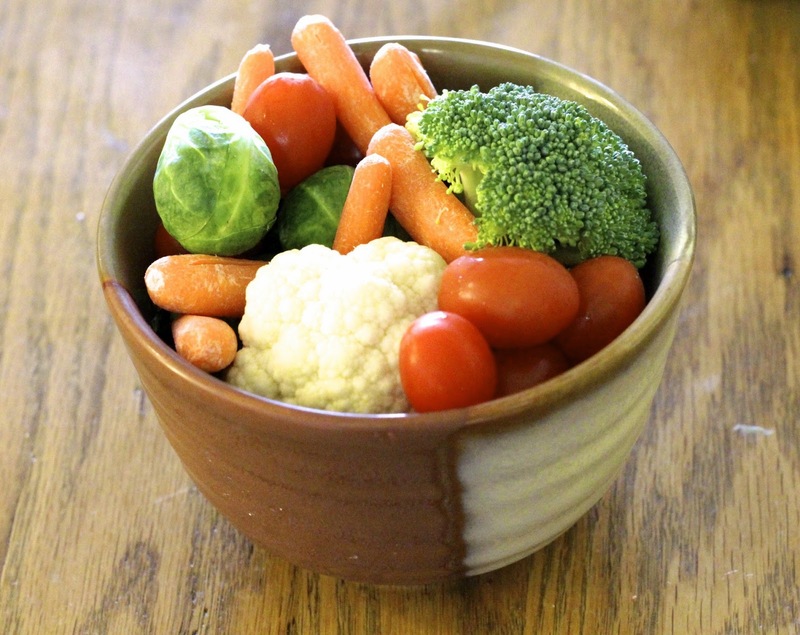 -Steam veggies in the microwave. Throw a handful of brussels sprouts and a couple inches of water into a bowl, cover it with a plate, and microwave for 4-5 minutes. Voila! -Eat raw. I measure out about 6-8 ounces of baby carrots for a midday snack every day and dip them in fat free zesty Italian. My favorite! -Find some favorite low calorie dipping sauce. I found some amazing low fat Caesar that I'm totally hooked on right now, and it's so good with cauliflower and broccoli with my dinner. -Carry a cooler. I'm so nerdy you guys, but if I'm going to be out for a long time, I always bring my lunchbox with some combination of yogurt, carrots, cottage cheese, pistachios, and an apple. It may sound ridiculous but you know you're eating healthy when you've got something perishable. It's so easy to just throw an ice pack and some baggies of the good stuff in so I don't end up in a bind. -Vegetable juice. I love V8, especially in a hurry when I'm craving something nutritious! Sometimes I'm better than others about eating healthy, but I always notice a huge difference when I'm doing well. I have more energy, my mood is better, my cravings are in check (you won't believe me but I've almost completely cut out candy, which is huge for me! ), and my appetite stays steady throughout the day. What are your favorite ways to eat the rainbow? Tell me- I'm always looking for new ideas! These are really great tips! I love vegetables but I don't eat enough. I love carrots in dip so much, unfortunately I love Ranch lol.